We believe in providing the finishing touch to our installations. Al Madar Metal Construction Factory, a division of the Arman Group, has a glassworks section which deals specifically in the finishing process of your building works. Whether functional or spectacular, we can produce glass panelling and window systems to suit your project. Tying in with our aluminium extrusions section, we can provide you with a solution which covers all the glass works required to finish the job. 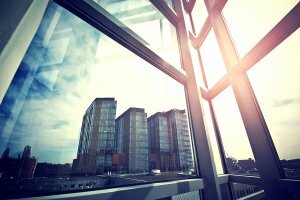 Whether you are looking for standard window units, glass facias or indeed, something special, we offer the infrastructure and versatility to produce a solution which suits you exacting requirements. From individual skylights to glass floors or frameless assemblies, we have all the necessary experience and assets to ensure we produce your finishing glass products to suit your specific needs. And as we handle all of this in-house, it is a cost effective solution for your project and negates the need to outsource. We know from working with architects and designers that the aesthetic appeal of your project is important. We have the flexibility to offer you a bespoke solution which is a perfect fit for your design. Whether your building requires a plate glass frontage or just simple windows in a distribution and logistics warehouse, we can cater for your needs.